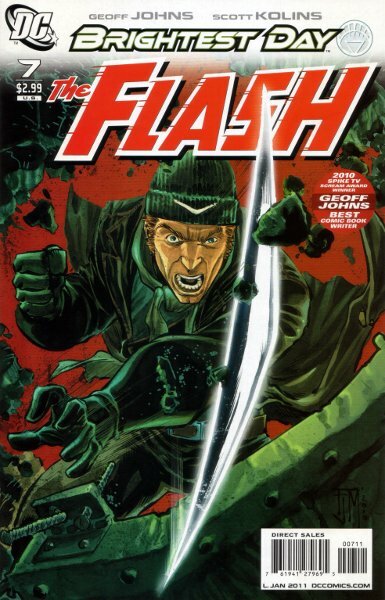 Those unfamiliar with the Rogue Profiles from Geoff Johns’ previous Flash run might dismiss a whole issue focusing on Captain Boomerang as filler. And while it’s true that this issue and the next were added to the schedule to get the main story back on time, it feels like an integral part of the mythos (if a bit more related to Brightest Day than to the story building to Flashpoint), and leads directly into next week’s issue’s profile of Professor Zoom. Like the earlier profiles, this issue follows the featured villain as he goes about his business and thinks back about what made him the criminal he is today. It serves both as an origin story for new readers and a way for the writer to explore just what makes him tick. In this case, it doesn’t add anything really new to his background, but rather collects and crystallizes the key elements that have been established over time: a troubled family life (what Rogue didn’t have that? ), coming to the States as a toy mascot, and then embarking on his life of crime. I’ve raved before about how well Scott Kolins’ art is suited to the ruggedness of the Flash’s Rogues Gallery, and that remains true here. Yet his art is transformed by Brian Buccellato’s painted-looking colors, making it blend perfectly with Francis Manapul’s work and revealing just how much of the look of this series is due to his contribution. 10-year Flash veterans will appreciate some of the references to Geoff Johns’ run on Wally West’s series: the presence of Girder, for instance, or the fact that the prison transport is run by the Cage Factory. Not to mention Scott Kolins’ art! Silver-Age and Bronze-Age Flash fans might wonder about the retcon in which Digger Harkness’ patron, toymaker W.W. Wiggins, was also his biological father, but that goes back 20 years to Suicide Squad #44 (1990) by John Ostrander and David M. DeVries. It’s an earlier retelling of Digger’s origin, and could be considered the first Rogue Profile. Edit: While the revelation was established quite a while ago, I think Digger’s reaction in this issue is new. I was surprised that this only took up two-thirds of the issue, though, with the last third serving mainly to remind us that Professor Zoom is an egotistical sadist (though it is interesting to compare his attitude with Boomer’s pragmatic one). Considering we’ve got an entire issue focusing on the Reverse Flash in a few weeks, I think I would have preferred a little more about the lead character. How he ended up involved with Bart Allen’s mother, for instance, and how Owen came back to the present day. On the other hand, this series has been very focused on streamlining the storytelling: It’s not important for now that Boomerang has a son, so it doesn’t get mentioned. It’s not important for now that he’s died and returned to life twice (first in Underworld Unleashed and Hell to Pay, then in Identity Crisis and Blackest Night), only the second time, so that’s the only time that gets mentioned. Conclusion: Great artwork and a good done-in-one story that still ties to the overall series arc. This entry was posted in Reviews and tagged Brian Buccellato, Captain Boomerang, Geoff Johns, Professor Zoom, Rogue Profile, Scott Kolins on December 11, 2010 by Kelson. 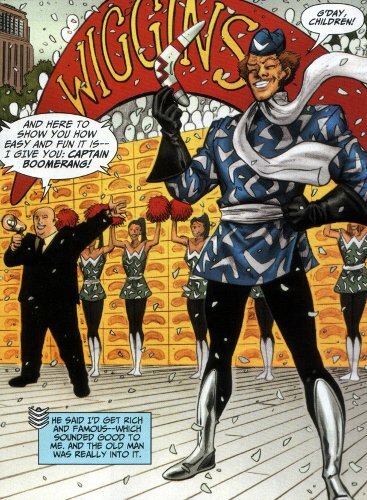 Arguably the Top’s costume has a reason for looking gaudy, and it’s tied in with Digger’s — Johns hinted in Flash #216 that the Top’s costume is based on the Wiggins mascot. But holy high hell, Zoom is crazy-scary. Two weeks if you believe the comic, three if you follow the official site. Don’t know what’s up with that. I had my doubts going into this issue about story and art. When this was first solicited, Kollins’ new tonal style was pretty sloppy and unattractive. Thankfully,, he’s stepped it up a ton. Surprisingly, the Brian Buccelato colors weren’t all that impressive here as they are with Manapul’s art. Scott’s latest art on JSA is colored by Mike Atiyeh and looks even better there. Still, I walked away from this issue happy. My own complaints would be hoping that Girder didn’t get killed off and wondering why the Rogue’s were popping up at Iron Heights. But I can get over both of those. It looked like it could be a farm in Smallville. Rural Aussie speak is all but inpenetrable, the foliage was debatable, the steering wheels appeared to be on the wrong side, and a boy in the sticks that has never seen a boomerang before?? All kidding aside, thanks Mr. Kolins for pitching in to get #7 out for us! …and thanks for a shot of Boomer’s old duds. They were always so bad that they were great.